Early on a Friday morning in August, and the start of what promised to be a bit of an adventure. Oh yes indeedy – Daughterus Maximus, a.k.a. Travelling Pumpkin, and myself had a ticket to ride on the now infamous charter coach from Milton Keynes down to the world’s first ever Giga Event, which was being held in Munich on August 16th. The bus was due to leave the MK Coachways bus station at 7am, so we got up at 5:40am to grab a bit of breakfast and sort ourselves out in time for Kas driving us down there. Anyway, there was a pre-coach flashmob event to be attended at 6:45am. Obviously the previous night we’d prepared ourselves thoroughly by making sure everything was packed up and ready to go, before having a final evening meal in Blighty by attending BBH #80 – Bordering on a Giga! at a pub just up the road from our house. Kas very kindly drove to that one so all four of us attended and I was able to consume the (cough) correct amount of beer required to prepare for a long coach journey, i.e. enough to feel groggy but not nauseous the following morning. And as ever, because there was an exciting weekend in prospect and I was knackered anyway, I was totally unable to get to sleep. There was a bit of general discombobulation at the coach station caused by several factors – an absence of strong coffee, a requirement to pay for the toilets, a daft idea about people on the bus signing the log for the event in the building rather than getting on the bus and signing it there, that kind of thing – but then not long after 7am and with the requisite number of people onboard we set off down the motorway for the start of our somewhat epic trip. The first part wasn’t so epic though. “Tedious” would be a better description. At least there were some good friends on the bus and, judging by the chat from behind us, there were some vodka-filled gummy bears too. So that got the party off to a good start for some of the crew while we were plodding our way around the M25 and over the QE2 Bridge. And all of this joy lead us to another pick-up point in Ashford, where we were joined by enough bums to fill the remaining few seats. All of those bums had a cacher attached to them, by the way. We got there at about 9:30, which was slightly late for the Breakfast event, but they bought the book onboard and we all signed it anyway. From here we had an appointment with a large ship at the Dover Ferry Terminal. On the way, though, we had to make a stop at Maidstone Services to swap drivers – we’d been driven down by one guy who was obviously doing the UK-only section, and we were joined by two drivers who were coming all the way down to Munich and back with us. 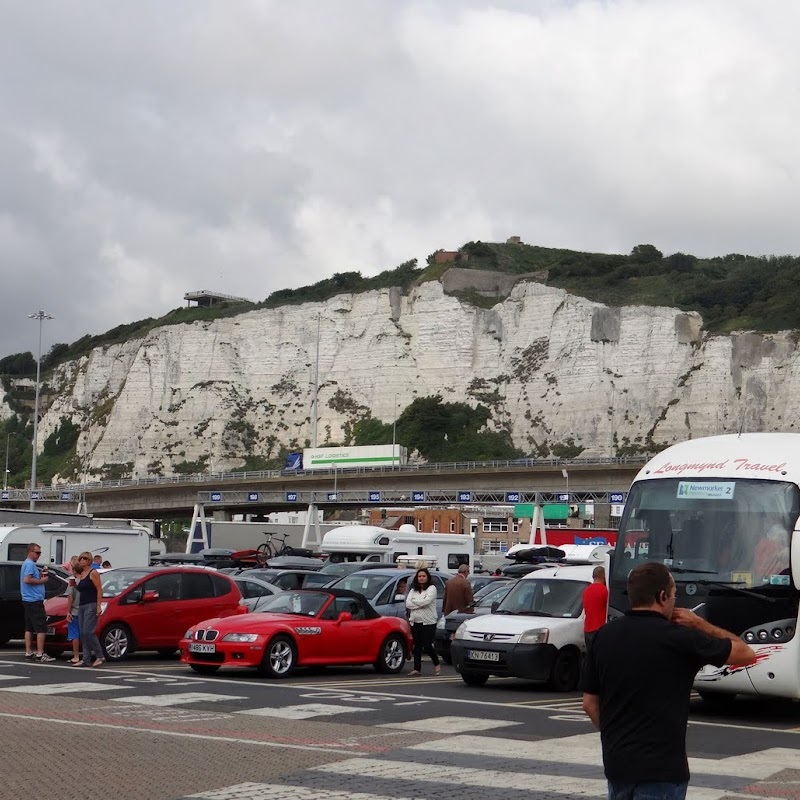 Somehow when Simply Paul was working out the costs it looked better to take the trip out by ferry but come back on the Eurotunnel Shuttle, so that’s what we did. There were some rumours about what time we’d got a ferry booked. In the event it was very quick to get into the ferry terminal, despite having to fill out loads of forms for the one Canadian national onboard, and we made it onto a ferry leaving at about 10:45. 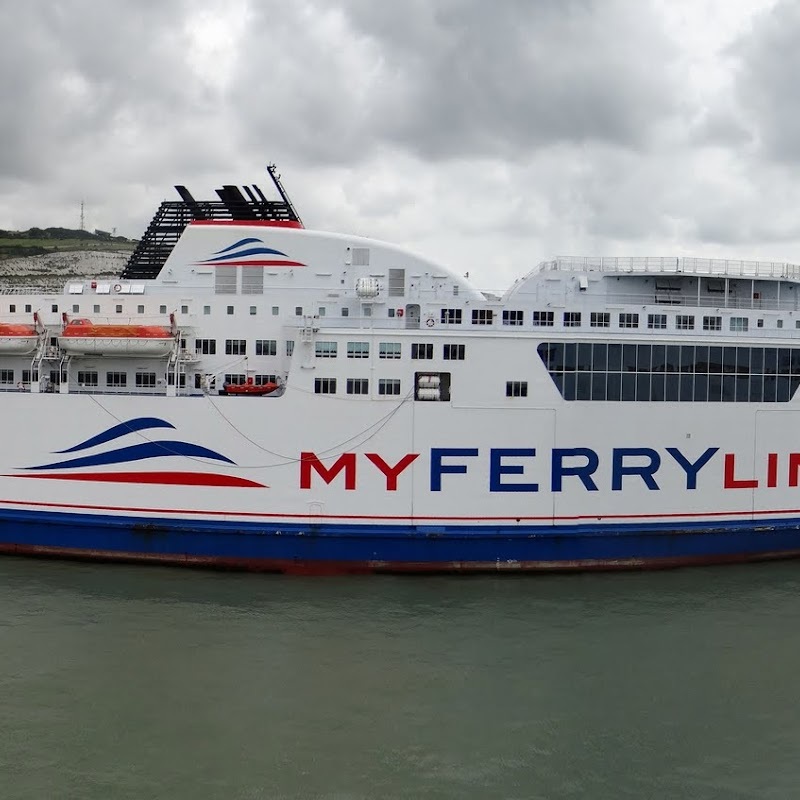 I’ve never been on a ferry from Dover to Calais before. Blimey ! It wasn’t actually as bad as I thought it might be. The weather wasn’t great so it was a bit damp out on deck as we were setting off, but once we were underway it all seemed very pleasant. Ami and me went inside to the food court to grab a very healthy lunch of pasties and chips and we sat with EmmaW and the attending members of Dave’s Piglings watching the sea, sky, and pasties drift by. Once suitably lunched-up we decided to go and grab some fresh air out on deck, at the “blunt end” as we seafaring folks call it. I was just making a comment about how close the French coast was starting to look when I glanced over the other side of the ship and saw a cliff right next to us. OK, so it doesn’t take that long really. 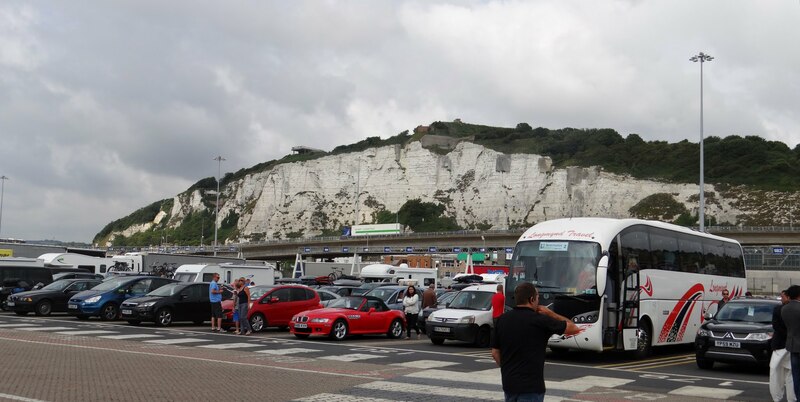 Getting off the ferry and onto the motorways was a doddle. Seemingly no checks whatsoever were involved and we were up on the nearest autoroute before you could say “Robert est ton oncle”. We were heading for Belgium’s oldest cache and then a random cache in Luxembourg, but before we could get there we had a few miles of French motorway to get across. For myself an Ami the first bit of this all looked very familiar, having only been back from our holiday about 10 days earlier (see Coming Home). It wasn’t long though before we were off down the A25 towards Lille – new territory for most of us, I would suspect. It was definitely new territory for Izzy from the Piglings, who up until this trip hadn’t ever been abroad, and for Mrs Pigling, who hadn’t been abroad since before the junior Piglings came on the scene. I’d like to say myself and Ami are a bit old hat at this European motorway malarkey, but that would be a bit grand. Let’s just say I have a lot of European motorways in my past and Ami has had the delights of driving long distances through France, Belgium and the Netherlands on at least four occasions already. The A25 towards Lille was new, but not particularly spectacular, territory for us all then, I suspect. By the time we got to Lille there was a bit of muttering about not having done any caches “on the continent” yet so Simply Paul identified a random roadside cache (street art n°1) that looked like we could park a bus, and he jumped off with one of the drivers, who went along to get to grips with what they’d let themselves in for. Well that was a quick one. After this we had a short stretch of no motorways followed by a seamless transition into Belgium from France and then a bit of Belgian motorway before going off piste to make an attempt at what is supposedly Continental Europe’s oldest geocache – the imaginatively named “Geocache“. This one is placed at exactly N 50° 00.000 E 005° 00.000, a spot in the middle of a forest to the south of Dinant. This was what you might lovingly refer to as “one for the purists”, not because of the cache, which was a fine effort of the ammo can variety, but because of the miserable weather. As we were in a bus, the driver had to park wherever he could manage, which turned out to be up a small side-road about 400m from the cache itself, and just as we were arriving the heavens opened and “il pleut des chats et des chiens” as they undoubtedly don’t say in that part of the world. Seriously – it was only a few hundred metres, but everyone got absolutely soaked. It did also provide the opportunity for several male members of the group to turn their bikes round in a forest setting before getting back on the bus. So as we moved on from here there was a sort of soggy, foresty smell on the bus. Nice ! By now it was well after 5pm and we still had a long way to go. In fact, I think it was around this time that we started to realise that we’d maybe got a lot further to go than we’d thought we’d have by this time of the day. Next stop was a very heavily favourited cache in the very bottom corner of Luxembourg – another 120km or so away. Given the state of the roads we were going to be travelling another 2 hours at least to get there. The cache in question was Forever, which is at that little bit in the south-east corner of Luxembourg where it seems to co-exist with Germany and France. The cache is a padlock attached to a local monument where the form is that you’re supposed to add your own padlock to represent togetherness and permanence. It proved to be a fairly quick find with upwards of 20 people scrambling all over it. As we were leaving and the bus driver was attempting to find somewhere to turn around, we passed a small museum, and then we drove into France very briefly, turned round, and passed the museum again and then joined the motorway crossing the bridge over into Germany over the Moselle River. Someone behind made a comment about how the countries were all so close together here and how easy it was to cross between them, completely failing to notice that the little museum was, in fact, in celebration of the Schengen Agreement – the treaty that in 1996 removed all internal border controls between the states of Germany, France, Belgium, Luxembourg and the Netherlands originally, and which now encompasses all European Union states (or will encompass them) with the exception of the Republic of Ireland and the UK. Yes, the cache was in Schengen. And in our current time of wondering whether we should stay in the European Union or leave it, this, my friends, is a fine example of what the EU is supposed to be about – treating the continent of Europe as a single economic entity rather than several. Notice though that I say it’s what the EU is “supposed” to be about, rather than what it actually currently is about. That is a whole other debate which will run for ages, and which is irrelevant to this blog, and which, given the political mood in the UK at the moment, is liable to make my blood boil at some point soon. And so began what proved to be the nightmare part of the journey. Luxembourg to Munich is at least as far as Calais to Luxembourg, and at the point where we left it was already well past 8pm, we hadn’t stopped at all for any length of time and it had taken us more than 7 hours from Calais already. People were frantically calling their hotels to make sure they had a 24 hour check-in facility. Ours did – I checked it before we set off. Initially we followed the motorways around Saarbrücken and over towards Karlsruhe. By the time we got there it was already well into darkness. At some point there was some general discontent and the bus drivers were persuaded to stop at some motorway services near Pforzheim at about 11:30 as we still had a long way to go and most of us hadn’t packed food to last quite this long. So we made a brief stop which involved some burgers, a quick cache (T-Helferzelle), and, in my case, a total scare as I stuck my bank card into an ATM to grab some Euros and ended up not getting anything back. In the event, the machine didn’t charge me anything, but it took me until I got home to discover that, and in the intervening time I was kicking myself for having stupidly chucked away 80 Euros or so. I didn’t know whether the machine had rejected my card, or whether I’d cancelled the transaction, or whether I’d been too slow and the machine had locked the cash away, or even whether it had produced the cash but dropped it behind a swing door where I hadn’t looked. The moral of that tale is probably to only use a foreign bank machine that is attached to a bank, and to do so in daylight and whilst vaguely awake. The route from here took us around Stuttgart and then all the way into Munich along the A8 autobahn past Ulm and Augsburg. Well, it should have been “straight along”, but we seemed to spend some unearthly amount of time in roadworks or being diverted off the autobahn through quiet little towns, so it wasn’t as straight as it should have been. Eventually, those of us that were still awake (or who had woken up after a short and fitful night’s sleep) were greeted by some motorway signs advertising our arrival in Munich. It still took another half hour after that to get into the city centre and the bus eventually pulled up outside the Hauptbahnhof at a rather frightening 4:30 am. After leaving our house at 6:30am UK time the previous day that means it took a full 21 hours to get from MK Coachways to central Munich. Several people were having a serious sense of humour crisis. Simply Paul resolved to rearrange the trip home to make our scheduled train crossing rather later. And everyone still had to get from the station to their hotel. At 4:30am there are a few, but not many, taxis at the station. For Ami and me though we had just a 5 minutes walk through reasonably lit streets to get to our gaff – the Hotel Daniel. We made it last 10 minutes though as we had trouble finding the right exit from a huge U-Bahn station/underpass thing that walked into to avoid crossing a busy road with no route through the tram lines. Thankfully, once we did arrive, there was indeed a night porter who checked us in, told us about the breakfast arrangements and gave us our room key. So we were quickly upstairs to find our nice cosy little twin room (long and thin with two single beds arranged end-to-end). We were both too tired to bother with the niceties of cleaning our teeth of properly finding our jim-jams, so straight to bed it was with the alarm set for a fairly reasonable 9:30am and a promise made to Dave’s Piglings and EmmaW that we’d call them about meeting up back at the Hauptbahnhof at around 11am to get on with a bit of caching. That was a long day !